Forging a historic win for labor in the notoriously anti-union South, workers at the nation’s largest hog slaughterhouse won a 16-year battle to unionize their plant in December. 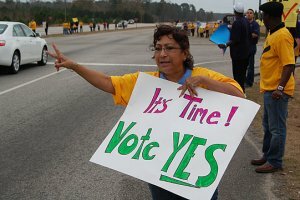 Workers, organizers, and community supporters gathered at a Holiday Inn on December 11 to await the result of the election at the Smithfield plant in Tar Heel, North Carolina. The mood was anxious, with many recounting the long battle and many obstacles that had to be overcome just to get to a vote. When the news arrived that 2,041 workers had voted for the United Food and Commercial Workers (UFCW) and 1,879 voted against it, the room erupted in cheers. The plant, about 80 miles south of Raleigh, had seen two previous union elections in the 1990s. They were overturned by the National Labor Relations Board and an appeals court, which found that the company spied on workers and had some beaten up on voting day. The company was forced to pay $1.5 million to workers it had harassed and fired. The path to the third vote had taken unusual turns in recent years. The union launched a boycott and pressure campaign and funded an environmental justice group that was fighting the hog butcher’s pollution seeping from giant waste lagoons. Activists as far away as Massachusetts pressured city councils to pass resolutions condemning Smithfield, convinced supermarkets to pull the product from their shelves, and hounded a celebrity chef paid to endorse the company. Smithfield fought back with a racketeering lawsuit, claiming the union’s campaign had cost the company $900 million—and amounted to extortion. But when it was faced with the prospect of its grisly health and safety record being aired in court, the company settled in late October, giving the union just six weeks’ sprint to the vote. UFCW sent in experienced organizers and even borrowed organizers from other unions. It mounted an intense program of house visits, while the in-plant committee maintained high visibility. They leafleted every morning and afternoon before each shift. Adding to the stress on workers, the plant was operating six days a week during the election period to meet the holiday increase in production. The settlement’s terms made this election much different than previous votes. This one took place without firings or beatings for union supporters. The company held two mandatory meetings for each work group, but the script for the meetings had to be approved by a monitor, who guarded against disparaging statements from either side. The settlement allowed union organizers time in the plant to speak with workers—which is almost never permitted in union elections. 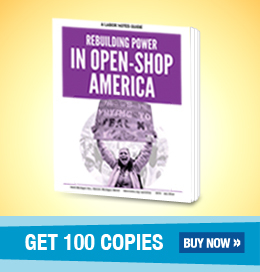 After years of company attacks on the union, for union organizers to walk into the plant impressed workers with the union’s power. Workers, who start at about $10 an hour, gave speeches to hundreds of coworkers in the plant’s cafeteria, and hundreds more wrote “Union Time” on their hard hats, a slowly building action that rank-and-file organizers began last May. Nichele Fulmore is a member of Teamsters Local 391.